"Abstract and Symbolism Paintings: Russian and Georgian Artist Omar Chkhaidze"
Gallerie Icosahedron invites you to their New York exhibition of Abstract and Symbolism paintings of Omar Chkhaidze from November 1 till November 28, 2007. Omar Chkhaidze is an internationally renouned Russian/Georgian artist who lives and works in Moscow, Russia. Paintings by Omar Chkhaidze are in the collections of Russian and Georgian museums as well as the Vatican�s collections. On this exhibition Chkhaidze presents a new body of paintings, which were created in a abstract style which the artist is developing. Also shown along with these new works are a selection of his older paintings done in a Symbolist style. 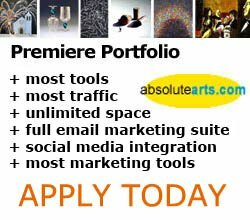 Omar Chkhaidze has been a Premiere Portfolio Artist at absolutearts.com since 2007. ...Our world has strongly changed during last years. And my attitude has strongly changed too. I have expressed my new feelings in my new paintings. I need to know that spectators will tell about it - stated the artist in his last interview. Some art critics classify Omar Chkhaidzes creative manner as symbolism or associative-metaphorical style, others specify his style as classical avant-gardism. But all agree that the master has created the individual unique style, and the unique painting technique. The artists works represent the new word in painting, the art of the new era, the art of the Future. Omar Chkhaidze is a master whose world outlook has absorbed the wisdom of the East and the West. His works do not confine themselves to time and space frameworks - they have a really cosmic scale. The artist is positive that it is Love that lies in the foundation of the Universe. Only Love can create things, only by means of Love and in the name of Love one can do wonders. This idea goes through all the works of the maestro. The refined feel have the line and spatial depth, together with absolute pictorial freedom, help reflect both the inner and external beauty of the world. Harmonic combination of intellectual potential and high spirituality level offers Omar Chkhaidze a unique opportunity to pass through himself everything initiated from above, and expresses this in his paintings. His every work, like a drop of water, reflects the Universe. Omar Chkhaidze is a mouthpiece of the new spiritual paradigm of the third millennium. Having discovered for yourself the world of this amazing artist you will be able to sense the joy of life filled with Love and Harmony, to touch the Eternity. The New Spiritual Paradigm. The coming of every new era requires its spiritual mouthpieces. Today, on the brink of two millenniums, witnessing the transition from the Age of Pisces to the Age of Aquarius, the Earth planet is being influenced by the new energy giving a tremendous impact towards the change of human consciousness, the change of scientific and spiritual paradigms. Fulfilling their predestination, the spiritual leaders of the planet - writers, composers, artists - persons deriving information from above, are carrying it to the people by means of their works of art. That is the way it has always been. Among such channels were Leonardo da Vinci, Johann Sebastian Bach, Johann Wolfgang Goethe and others. Today Omar Chkaidze is such a channel. After the year of 2000 Omars painting manner and style critically changed. He is breaking away from his attachment to the object, shape, which helps him to freely carry the vision of the Universes spiritual world. He has always said: The time will come and I will have my word. And this time has come. His paintings may seem to the viewer as some meaningless strokes of the paintbrush on a bright background. While for the dedicated - these are the letters from Home, full of sacred sense, carrying on recovery, enlightenment and love. Omar Chkhaidze was born in 1945 in Georgia. He graduated from the Arts School in 1966, then from the Academy of Arts in Tbilisi in 1973. As a student, Omar participated in numerous art exhibitions held in Georgia and Russia as well as several in international shows across Europe. View more of Omar Chkhaidzes work in his Premiere Portfolio at absolutearts.com http://www.absolutearts.com/omarch.